For startups, outsourcing product development would seem a no-brainer, offering lower costs, an hourly rate, and a faster time to market. So, the author asks, why aren’t more startups using this option? In delving into this question, he discusses in some detail the startup environment, and the factors to consider when deciding what to outsource. He also discusses the downside of outsourcing product development, such as frictional (relationship) costs and strings attached resources. 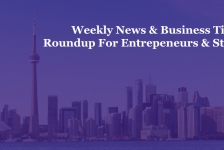 In Toronto business news is the announcement by Ripple Ventures, an early-stage venture capital firm focused on early-stage tech startups in North America, of closing its first funding with a capital commitment of $10 million. The firm also announced the opening of its new incubator space for portfolio companies, the “Tank,” in downtown Toronto. Launched this year, Ripple Ventures touts an “Operator First, Investor Second” approach to funding. Its founder and managing partner is quoted as saying “Ripple Ventures is committed to strengthening the connection between investors and early-stage startups with an expansive advisory team of industry veterans and Entrepreneurs in Residence to assist their companies in navigating everyday problems.” The Fund will focus on early-stage tech companies in Toronto, Waterloo, Montreal and Boston. While you don’t necessarily need a Master’s in Business Administration (MBA) to succeed as an entrepreneur, the education you receive can help with acquiring the skill set needed, especially in leadership, business analysis and communication, and even IT. It can also help you in expanding your professional network, as well as enhance your understanding of business strategies and operational structure and efficiencies. The author of the recently published book, The Launch Lens: 20 Questions Every Entrepreneur Should Ask, discusses his own experience launching a SaaS business with a partner, both assuming they’d be able to raise venture capital as they both had a proven track record in building and operating software businesses and generating money for investors. While it all turned out well, they had to grow far more slowly than they’d hoped. That led him to look more closely at questions such as, if you’re thinking of launching a business or taking your existing one to the next level, should you try to raise outside financing? If so, what types of funding sources would consider your venture an attractive investment? Contemplating these questions led the author to introduce “The Startup Fundability Matrix” (from his book), “a conceptual framework that can provide you with preliminary answers to these questions.” With the horizontal axis indicating capital efficiency and the vertical axis denoting valuation multiples, the matrix is composed of four quadrants: venture capital, patient capital, bootstrap and “dead zone.” He then discusses how he could have used this tool, and how you can now. What would you think if you were to hear that the best way to tackle a lack of motivation isn’t to ask for advice, but give it? That’s the surprising, if not counterintuitive, conclusion of a new article by psychologists from Wharton and the University of Chicago. The authors conducted a series of experiments premised on the insight that when people don’t do what they know they should, it’s not due to a lack of information, but rather a lack of confidence. For whatever reason, people who don’t believe they will succeed never get started – so giving them advice (i.e., information) doesn’t do anything to boost their confidence. However, the team found when people struggling with motivation instead gave advice to those facing the same challenge, so did their confidence – and their own motivation. Enterprise Toronto, funded by the City of Toronto to help small businesses, will be holding a 10-course training program called “How to Run Your Own Business” this October. The program is designed to help all entrepreneurs with developing their business ideas and growth plans, whether they’re starting out, needing to refine operations, or planning to expand. The program is focused on developing all aspects of a business, and provides connections with mentors, as well as the opportunity to work from Enterprise Toronto’s North York Civic Centre Office for up to six months. “Most of us think we know what matters most to the other party before we even sit down to negotiate, and that getting what we want comes at the expense of others,” the author begins, “Based on these assumptions, the value we create for ourselves and other parties involved are rarely what they could be.” She then details six things you’re likely doing wrong in negotiations, from not making the first offer (when it’s beneficial to do so) to using the same tactics in both short-term and long-term negotiations. According to a study of over 3,200 startups, 70% scaled prematurely, which heavily contributed to its other finding that nearly 90% of startups failed. Here the author discusses how to determine when to invest in scaling your business, by considering three indicators: you’ve achieved and overachieved your timetable for business goals; your market is growing and more opportunities present themselves; and lastly, your cash flow is strong and stable. Regardless of the position, new employees should acquire an understanding of the customers’ needs and expectations during their first week on the job. While those hired for a customer-facing role will receive just that, those in other areas, like operations and technology, may well not. Here the author describes three steps to take to ensure all new employees get to know the target customer during their first week of onboarding: teach the product so new hires understand the value of them; provide the customer experience, so new employees follow the same route as the customer when making a purchase; and lastly, engage with customer service, where new hires spend time shadowing a customer service agent.